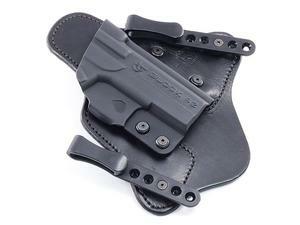 The MTAC’s Kydex body is also interchangeable, allowing you to have one holster for all of your firearms. You can purchase spare bodies on the Spare Body page. The MTAC attaches to the belt by two clips mounted to leather tabs on either side of the holster. These mounting clips distribute the weight of the loaded pistol while holding securely to the belt. A shirt may be tucked in over the gun and holster complete concealment. Most Comp-Tac Clips offer 5 holes allowing for complete adjustment to the cant and ride depth of the holster. Standard clips are a “P” shaped clip that slides over the top of the belt and hooks underneath. Holster may be put on while belt is already threaded through loops. Not recommended for nylon belts. Note: Comp-Tac fit checks EVERY holster with the actual make and model firearm. As a result, the leather backing may show slight wear marks or scratches from the fit process.